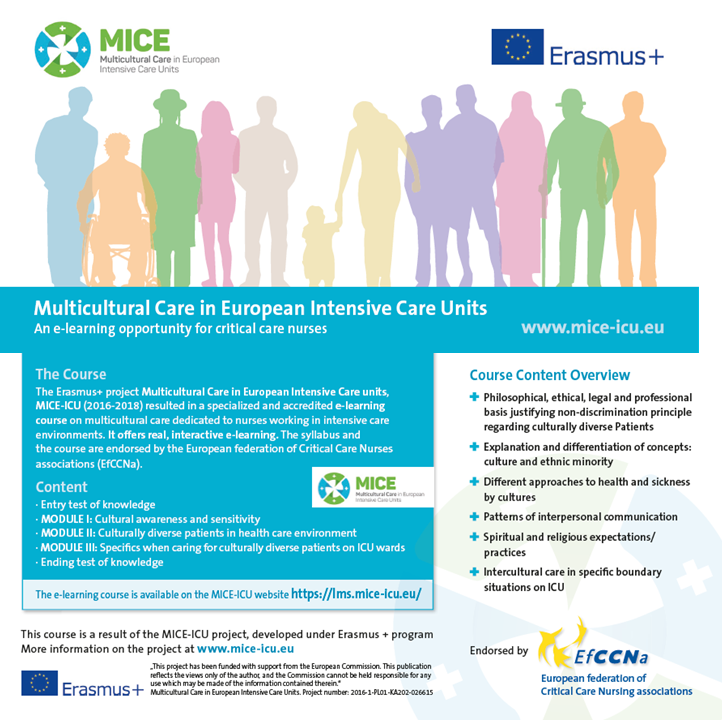 The Erasmus+ project ‘Multicultural Care in European Intensive Care Units’ - MICE-ICU (2016 – 2018) was initiated with the aim to develop a specialist multicultural course for ICU Nurses. 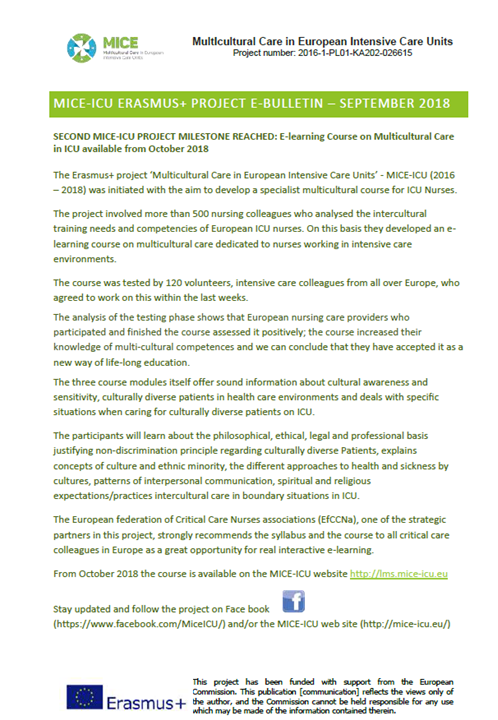 The project involved more than 500 nursing colleagues who analysed the intercultural training needs and competencies of European ICU nurses. On this basis they developed an e-learning course on multicultural care dedicated to nurses working in intensive care environments. The three course modules offer sound information about cultural awareness and sensitivity, culturally diverse patients in health care environments and deals with speciﬁcs when caring for culturally diverse patients on ICU. 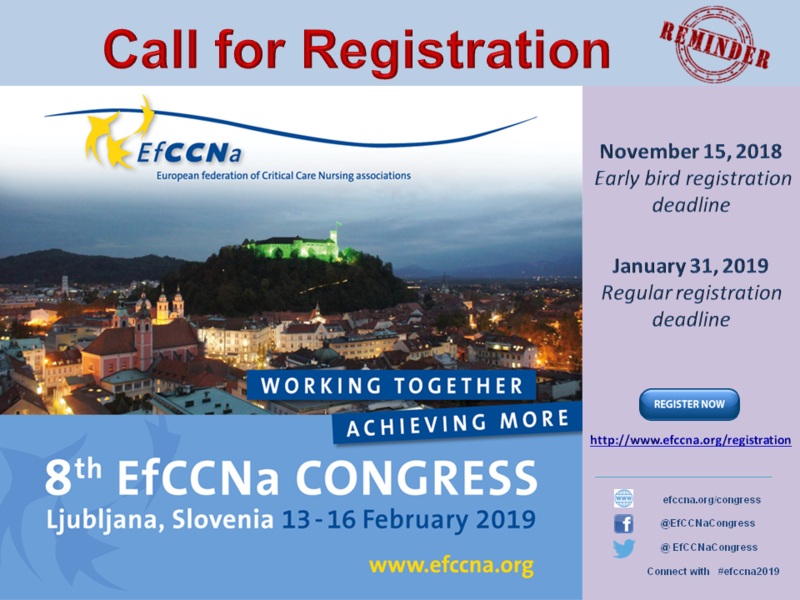 One will learn about the philosophical, ethical, legal and professional basis justifying non-discrimination principle regarding culturally diverse Patients, the concepts of culture and ethnic minority, the different approaches to health and sickness by cultures, patterns of interpersonal communication, spiritual and religious expectations/practices intercultural care in boundary situations in ICU. The annual report of the federation is now available for your information.